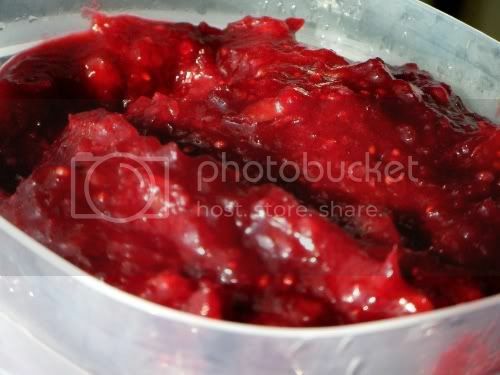 Yeah, I know Thanksgiving is almost a month gone now and most people don't typically eat cranberry sauce except around then, but this ain't no regular cranberry sauce- it's a cranberry Awesome Sauce! Heat juice and sugar on med heat until sugar is dissolved. Add cranberries and cook until they start popping. Add cinnamon. Keep cooking till it's whatchoo want, yo. then put it in a bowl or something. Dead simple. I love it. **But she forgot to mention the candied pecans she added. It was something like half a cup or so. Just add them in towards the end of the cooking (or earlier if you want them less crunchy). The pecan flavor goes really, really well with the cranberries. The candied pecans Amy used that day were ones I'd gotten from work; I wrote the recipe down, but lost it (probably for the better, since they likely wouldn't want me putting it on the internet anyway) but as I recall, it's just heavy cream, brown sugar, and pecans; maybe some cayenne pepper. Then toasted in the oven, probably on 250 F or something. No egg whites, like most of the recipes I've seen on various recipe sites (Allrecipes, Simply Recipes, Epicurious, etc). If you don't have, or don't feel like making, candied pecans, regular toasted ones would probably still be just as good. And of course, like I almost always do, I had to tweak it. Only a tiny bit, though. For starters, I pulsed mine a bit with the stick blender, whereas Amy left hers untouched. It's just a personal preference- I don't like mine too chunky or too smooth. I figured since we were going to be using candied pecans, I'd cut back on the sugar by 1/4 cup. I've since made it again without the candied pecans (it's better with, in my opinion) and still cut back on the sugar by 1/4 cup. Her original recipe isn't too sweet, I just like sweet things that are a little less sweet than 'normal. I also add a pinch of kosher salt to mine. Pretty much any time I make anything that has a fair amount of either salt or sugar, I always add a pinch or two of the other, for 'balance.' Maybe it's all in my head, but it seems to taste better that way. Then I made another batch with regular o.j. instead of the pineapple-o.j.- I think it's better with the pineapple-o.j. The difference is subtle, and may have been due more to the brands we used (the pineapple stuff was Dole, the regular o.j. was just a store brand), so more testing is in order, but for now I'm planning on sticking with the pineapple-o.j. Ground black pepper- a friend of mine adds it as a 'secret ingredient' and says it's wonderful. I tried it, but I think I went too light (2-3 turns of the grinder, set to fine) since I couldn't really taste any difference. I may also try ground pink peppercorns. Cardamom- One of my favorite spices. Definitely goes well with cinnamon, so I'd imagine it'd fit well in this sauce. Forget about that whole 'Cranberry sauce is for Thanksgiving' thing. And forget about that cranberry-flavored-crap-in-a-can... This simple, 5-ingredient recipe really is a cranberry Awesome Sauce. Depending on how thick you cook it, it could go great as a syrup over waffles, or spread on biscuits with butter. Just the other night I mixed some in with some Greek yogurt (The Greek Gods brand- it's as thick as cheesecake, and pretty damn awesome), and I have to say, if you want to get fat, that's probably a good way to go about it. Thanks for an awesome recipe, Amy! *probably not her real last name. Thanks for leaving the recipe word-for-word, as I emailed it to you. It was a masterpiece. I am a wizard with words! I did capitalize a couple things, just for a little polish. But no words were changed! "...then put it in a bowl or something." I should write cookbooks.